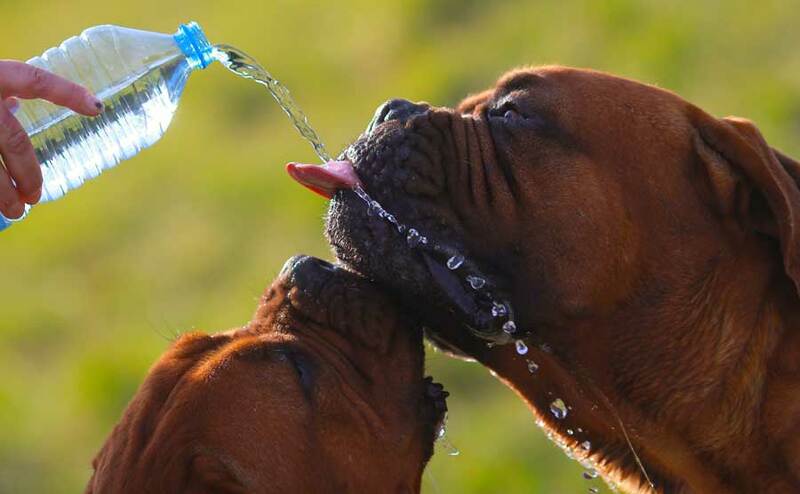 Keep your pets safe during hot weather. 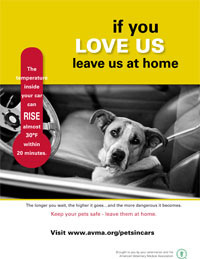 Every year, hundreds of pets die from heat exhaustion because they are left in parked vehicles. We've heard the excuses: "Oh, it will just be a few minutes while I go into the store," or "But I cracked the windows..." These excuses don't amount to much if your pet becomes seriously ill or dies from being left in a vehicle. The temperature inside your vehicle can rise almost 20º F in just 10 minutes. In 20 minutes, it can rise almost 30ºF...and the longer you wait, the higher it goes. At 60 minutes, the temperature in your vehicle can be more than 40degrees higher than the outside temperature. Even on a 70-degree day, that's 110 degrees inside your vehicle! Your vehicle can quickly reach a temperature that puts your pet at risk of serious illness and even death, even on a day that doesn't seem hot to you. And cracking the windows makes no difference. Want numbers? An independent study showed that the interior temperature of vehicles parked in outside temperatures ranging from 72 to 96º F rose steadily as time increased. Another study, performed by the Louisiana Office of Public Health, found that the temperatures in a dark sedan as well as a light gray minivan parked on a hot, but partly cloudy day, exceeded 125oF within 20 minutes. 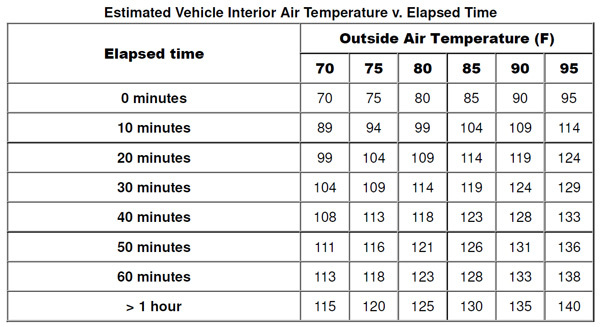 This study also found that cracking the windows had very little effect on the temperature rise inside the vehicle. This is definitely a situation where "love 'em and leave 'em" is a good thing. Please leave your pets at home at home when youcan...they'll be safe and happily waiting for you to come home. The risks associated with pets in vehicles don't end with heatstroke. Just as you should always wear your seatbelt to protect you in case of a collision, your pet should always be properly restrained while in the vehicle. That means a secure harness or a carrier. A loose, small pet could crawl down in the footwell, interfering with use of the brake or accelerator pedal. A small pet sitting in your lap could be injured or killed by the airbag or could be crushed between your body and the airbag in a collision, and a large pet leaning across your lap can interfere with your view of the road and can be injured by the air bag in a collision. 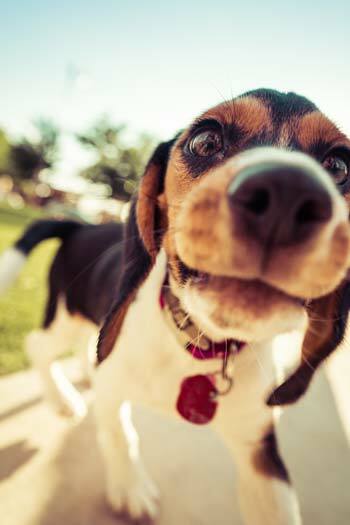 Unrestrained pets could be thrown out or through windows or windshields in a collision. And not only could your pet be injured in the collision, but it might also increase your risk of collision by distracting you and taking your attention away from where it should be – on the road. 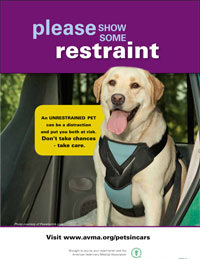 To learn more about the importance of restraining your pets, visit Paws to Click. Most of us smile when we see a dog's face happily hanging out a window, digging the ride and the smells wafting on the breeze, but this is a very risky venture for the dog for three reasons. 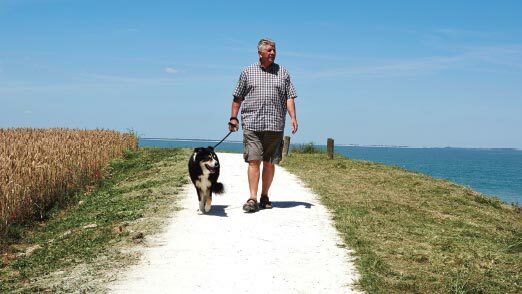 One, it means your dog isn't properly restrained – and we've already told you why that's so important. Two, your dog is at high risk of eye, ear, face and mouth injury from airborne objects when it's got its face hanging out the window. Three, letting your dog hang any part of its body out of the window increases the risk that (s)he could be thrown out of the vehicle during a collision, lose its balance and fall out of the open window during an abrupt turn or maneuver, or jump out of the vehicle to threaten another dog or a person. Before you put your pet in the vehicle, ask yourself if you really need to take your pet with you – and if the answer is no, leave your pet safely at home. If you must take your pet with you, make sure (s)he is properly restrained so the trip is as safe as possible for both of you.